This out door hospital was established in 1915 along with other departments of new building of the veterinary college Lahore. The teaching hospital is open for 24 hours. In the morning teaching staff is on duty, in afternoon a veterinary officer and during night time one academic staff member residing on campus is on duty. 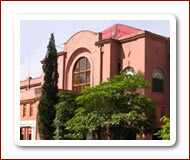 The hospital is providing services to general public, governor house, zoo, police and rangers etc. Diagnostic and treatment facilities are available. The clinical departments are equipped with conventional as well as some of the modern tools. Nominal charges of Rs.10/- and Rs.5/- are charged for large animals and small animals respectively on first arrival. At present in out door hospital/medicine section one professor, one Associate professor, two Lectures, two Veterinary Assistants and three Attendants are working. Well-qualified staff is available in the Medicine, Surgery and Theriogenology Departments for the treatment of animals. University has started a mobile ambulatory clinic and for that purpose efficient ambulatory van service will soon be available with the clinical department of the University either to treat the animal at the doorstep or to transfer the animal to the hospital for the indoor admission. University has also started and out reach clinic for large animal treatment etc. Near Sagghain Bridge at River Rive. Latest equipment for diagnosis will also be provided to the out door hospital.